One of my reasons for this choice is its a good quality radio with tuning of the full 40 meter band and no crystals. I also need to get cracking on learning CW so this seemed to fit right in. Anyway, I want to get started on the receiver next month so I am working on a few tools to work with and test the radio project as it moves forward. 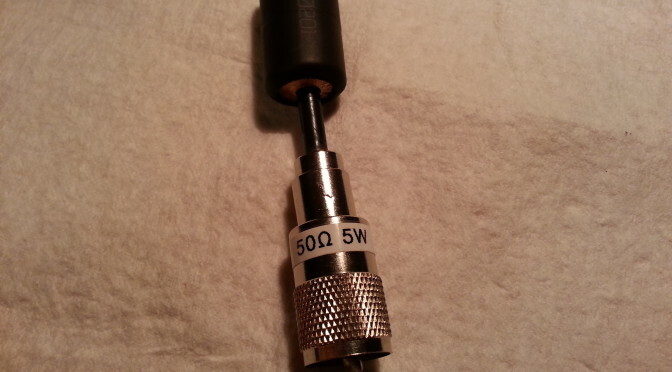 I have five tools to build, all of them are relatively easy to build and don’t have many parts they are a Peak-peak RF probe, an RMS RF probe, an RF sniffer, a 50 Ohm 5 Watt dummy load, and an RF power meter. Today I built the 50 Ohm 5 Watt dummy load. 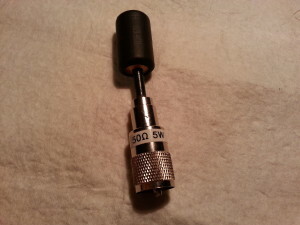 The dummy load is the black cylinder attached by a very short coaxial cable and connector. The guts of the load are twenty 1,000 ohm 1/4 watt resistors all connected together in parallel. One end of the resistor ribbon is connected to the shielding of the cable and the other end to the core wire. Then the whole thing is rolled up into a cylinder. The roll of resistors is covered by a sleeve of heat shrink to insulate it from the copper casing made from two 1/2″ pipe caps and a short piece of pipe. With the resistor bundle insulated I put a small zip-tie as a strain relief on the cable. Then the copper tubing and caps are closed up and another piece of heat shrink is put over the whole thing holding it all together. I futzed around for a while to make a cylindrical cage for the resistors and just wasn’t working out. The only reason I wanted to do it that way was to make in look a little classier… on the inside… anyway, now it is all done and works great. I can now test low power radios, up to 5 watts, without an antenna or transmitting spurious signals or doing damage to the radio. Yay!